Summary: The phenomenon of online bullying, which causes the victims a great deal of suffering, does not take place in a void, but rather it is related to the culture in which the bully and the victim were educated and to the context that gave rise to the bullying event. The current study constitutes an initial exploratory research that examined ethnocultural-religious aspects of online bullying in Israeli society. In particular, the researchers examined the influence of two variables on the rate of online bullying: participants’ ethnocultural-religious descent (Jewish, Muslim, and Christian citizens of Israeli) and the degree to which they believed in collectivist versus individualist principles. A total of 301 adolescents between the ages of 12 and 18 completed the following: an online questionnaire about cyberbullying, a questionnaire on individualism versus collectivism, and a questionnaire regarding demographic details. Findings indicated that the more participants’ cultural attitudes favored individualism, the less likely they were to be either witnesses to or victims of online bullying. These interesting findings will serve as a point of departure for discussing the online bullying phenomenon in the cultural and religious contexts of a multicultural society. Zusammenfassung (Noam Lapidot-Lefler: Cyberopfer und Cyberbystanders in einem ethnisch-kulturell-religiösen Kontext: Unterschiede zwischen den Sektoren in Israel): Das Phänomen des Online-Mobbing, das den Opfern eine Menge Leid verursacht, findet nicht in einem leeren Raum statt. Der Anlass für das Mobbing-Ereignis steht im Zusammenhang mit der Kultur, in der der Tyrann und das Opfer gebildet wurden. Die vorliegende Studie ist eine erste explorative Untersuchung ethnokulturell-religiöser Aspekte des Online-Mobbing in der israelischen Gesellschaft. Insbesondere wurde der Einfluss von zwei Variablen auf die Quote des Online-Mobbing untersucht: die ethnisch-kulturell-religiöse Abstammung der Teilnehmer (jüdische, muslimische und christliche Bürger Israels) sowie der Grad, in dem sie an kollektivistische versus individualistische Prinzipien glaubten. Insgesamt 301 Jugendliche im Alter von 12 bis 18 Jahren füllten einen Online-Fragebogen zum Thema Cyberbullying, einen Fragebogen zu Individualismus versus Kollektivismus und einen Fragebogen zu demographischen Details aus. Die Ergebnisse deuten darauf hin, dass, je mehr die kulturellen Einstellungen der Teilnehmer den Individualismus begünstigten, desto unwahrscheinlicher war es, dass sie Zeugen oder Opfer von Online-Mobbing wurden. Diese interessanten Ergebnisse können Ausgangspunkt für Diskussion des Phänomens des Online-Mobbing in kulturellen und religiösen Kontexten einer multikulturellen Gesellschaft sein. Резюме (Ноам Лапидот-Лефлер: кибержертвы и киберсвидетели в этно-культурно-религиозном контексте: различие между секторами в Израиле): Феномен онлайн-моббинга, который причиняет жертвам немало страданий, возникает не в пустом пространстве. Появление моббинга связано с культурой, в которой были созданы тиран и жертва. Настоящая работа является первым исследованием этно-культурно-религиозных аспектов онлайн-моббинга в израильском обществе. В частности, было исследовано влияние двух переменных на квоту онлайн-моббинга: этно-культурно-религиозное происхождение участников (еврейские, мусульманские и христианские граждане Израиля) а также степень, в которой они верят в коллективистские и индивидуалистические принципы. Всего 301 молодых людей в возрасте от 12 до 18 лет заполнили онлайн-анкету по теме «киберзапугивания», анкету по теме «индивидуализм против коллективизма» и анкету с демографическими деталями. Результаты указывают на то, что, чем больше установка участников склоняется к индивидуализму, тем невероятнее было то, что они становились свидетелями или жертвами онлайн-моббинга. Эти интересные результаты могут стать исходным пунктом обсуждения феномена онлайн-моббинга в культурном и религиозном контексте поликультурного общества. Internet technology has led to a cultural revolution in the life of adolescents in the last decade (Suler, 2004). In contrast to prior generations, adolescents of the current generation were born into a reality in which the Internet was a natural part of their lives, and children learned to surf the Internet at a very young age (Amichai-Hamburger, 2013). The use of the Internet has become in recent years a very significant part of the life of adolescents and they spend many hours a day on the Internet for purposes such as studies, knowledge acquisition, knowledge creation, and fostering social ties (Olenik-Shemesh, Heiman & Eden, 2012). In the current state of affairs, a significantly large proportion of adolescents’ experiences are accrued via the Internet (Amichai-Hamburger, 2013). The focus of the current study is on an important phenomenon that takes place in cyberspace and leaves a very real mark on adolescents’ lives, namely, online bullying, as viewed in an, ethnocultural-religious context. Online bullying, which is also referred to as cyber abuse, is defined as using the Internet for the purpose of directly and consistently harming a person or a group (Slonje, Smith, & Frisén, 2013; Mason, 2008). It has also been defined as purposeful, explicit and aggressive activities intended to harm a person or a group (Ybarra & Mitchell, 2004; Smith, 2015), in which case, it may involve the use of e-mail, mobile phones, text messages, or other interpersonal online communication platforms, utilized for abusive ends (Von Marées & Petermann, 2012). Online bullying can take various forms, such as harassing the victim by repeatedly sending offensive texts or messages (curses, insults, and/or threats), or impersonating the victim, by taking over the victim’s online identity and revealing information that harms the victim (e.g., outing). The latter method typically involves sharing the victim’s intimate information and details with a large crowd, against the will of the victim in order to shame and ridicule him or her. Other examples of online bullying methods involve the use of online tools to socially ostracize the victim: virtually following the victim’s online activity in an attempt to scare or threaten, as well as making direct threats against the victim, which can be perpetrated in the real world (Olenik-Shemesh, Heiman & Eden, 2012). A study conducted in Belgium found that the most common methods of online bullying included sending insults or threats via the online network, impersonating the victim on the Internet, disseminating gossip about the victim through the Internet, and hacking the victim’s computer in order to impersonate him or her (Vandebosch & Van Cleemput, 2009). Online bullying, like “traditional” bullying, involves three parties: the cyberbully, the cybervictims, and the cyberbystanders who witness the bullying. The bully, i.e., the aggressor who initiates and carries out the violent act, is often venting personal frustrations, by lashing out at weaker people in the environment (namely the cybervictims). Unable to cope with personal frustrations, the bully typically seeks a target who seems helpless and incapable of retaliation. Abusing a weaker person makes the bully feel strong and thus compensates for the frustration experienced. A different profile of a cyberbully is that of a bored adolescent who finds amusement in harassing someone else (“it’s just a game”) or someone who considers the attack to be no more than a prank (Amichai-Hamburger, 2013). There is also evidence that online bullying is conducted by adolescents who are physically weak and cannot afford to carry out their aggression face-to-face. Consequently, they take advantage of the online environment to anonymously attack other adolescents (Olenik-Shemesh, Heiman & Eden, 2012). One of the main explanations for the conspicuous use of the Internet as a venue for unleashing aggressive behaviors towards others is the phenomenon of online disinhibition or the Online Sense of Unidentifiability. The phenomenon refers to a process in which Internet users lose (or experience a lessening of) their normal sense of inhibition, leading them to give free rein to their thoughts and emotions, which they then express without any or with little fear of being judged or rejected by others (Lapidot-Lefler & Barak, 2012). Situation-specific factors, such as lack of eye-contact, anonymity, and invisibility, which appear to account for the online disinhibition effect, make the prospect of an online attack attractive to the aggressor (Lapidot-Lefler & Barak, 2012; Lapidot-Lefler & Dolev-Cohen, 2015), Studies have shown that the more certain the person is that his or her anonymity can be maintained, the greater the likelihood that the individual will consider or agree to attack someone else online (Mesch, 2003). The victim is typically an individual who has been socially shunned, who has no social protection, does not know how to cope with harassments, and whose self-image depends very much on others’ perceptions (Amichai-Hamburger, 2013). The cyberbystanders, who witness the bullying, can constitute a passive or active (encouraging) audience (Olenik-Shemesh, & Heiman, 2012). However, as a group, they constitute the largest party involved in online bullying (Heiman & Olenik-Shemsh, 2011). Studies from around the world indicate that online bullying is a rather common phenomenon and differences were found between countries in terms of the percentage of adolescents who are affected by it (Bouhnik & Deshen, 2012). A North American study conducted in 2009 found that 24% of adolescents participated in various ways in online bullying of others, and that approximately one third were victims of the phenomenon. A different study from the US indicated that online bullying was harmful to approximately 18% of all adolescents (Riebel, Jager & Fischer, 2009; Shariff & Hoff, 2007). A study conducted in Germany in 1987 among students of ages six through 19 found that approximately 20% of the participants had been victims of online bullying, of these, 5% experienced online bullying as frequently as once or more per week (Riebel, Jager, & Fischer, 2009). A study conducted in Belgium with 12 to 18-year-old participants revealed that 11% of the adolescents had been cybervictims, 18% had acted as cyberbullies, and 28% had acted as cyberbystanders (Vandebosch & Van Cleemput, 2009). Online bullying is not unique to Western countries, but rather, has been evidenced throughout the world. Thus for example, in Thailand it was found that 21% of students were victims of online bullying (Sittichai & Smith, 2013). A study conducted in Israel among middle-school students found that 16% had been victims of online bullying and 32% knew someone who had been harmed by online bullying. It was also found that the extent of the phenomenon is constantly increasing (Olenik-Shemesh, Heiman, & Eden, 2012). Another study found that 45% of adolescents had received offensive texts, 16% through chat platforms and 6% through e-mail. In the same study, 18% of the adolescents noted that they had initiated aggressive acts in cyberspace 40% of them had been both victims and aggressors (Goldschmidt, 2011). Yet another study, involving 1048 school-age adolescents attending schools that cater to six consecutive grades, found even higher percentages of adolescent involvement in online bullying: almost 70% of the adolescents had experienced online bullying more than once and 25% had bullied others at a rate of at least once a week (Bouhnik & Deshen, 2012). Online bullying has severe consequences for the victim. Online bullying victims have reported severe mental distress, including feelings of anger, rage, frustration, anxiety, bad moods, harm to their self-image, and difficulty falling asleep at night. In addition, online bullying distracts students from their studies, which leads to a decline in academic achievement over time. Another detrimental effect of online bullying is the experience of social rejection by schoolmates, precisely when youths go through a period of self-development and growth, during which the individual relies heavily on social and peer perception. As a result, online bullying victims may demonstrate behaviors of introversion and seclusion, as well as avoidance of social situations (Olenik-Shemesh Heiman, & Eden, 2012). The findings of the study by Olenik-Shemesh, Heiman and Eden (2012), which was conducted among a sample of Israeli adolescents of ages 13 through 16, demonstrate the devastating effects of online bullying on the victim. Victims of online bullying demonstrated more signs of loneliness, social isolation, and depression than did their peers who had not been victims of cyberbullying. A study conducted by Tarablus, Heiman & Olenik-Shemesh (2011) underscores the harm caused by online bullying, as 44% of participating adolescents claimed that the effects of online bullying were as harmful as face-to-face violence, and 15% of them claimed that it was even more harmful than face-to-face violence. The overall harm to the victims of online bullying can be overwhelming and complex. Given that the Internet provides constant access (in terms of location and time), the act of online bullying is not contained within the parameters of the school (as is the case of “traditional” bullying), but can continue at all times, regardless of the location of the victim, the bully, or the bystanders (Olenik-Shemesh, Heiman, & Eden 2012). The fact that using the Internet can harm the victim beyond the school perimeters is particularly important, because it increases the victim’s sense of vulnerability; the menace is constant at all hours of the day and night without any option for finding relief or refuge. As a result, online bullying can be more dangerous for the victims than “traditional” face-to-face violence (Goldschmidt, 2011). The impact of online bullying is compounded by the fact that victims tend to conceal rather than report incidences of violence against them perpetrated through the Internet. This in turn makes them easy victims of ongoing online bullying. A study conducted in Israel found that one quarter of the victims of online bullying did not report the events (Olenik-Shemesh, Heiman & Eden, 2012). Online bullying victims avoid reporting these events to avoid the ensuing embarrassment, humiliation, and stress, and out of fear that their parents will forbid them from using the Internet henceforth (Terabalus, Heiman & Olenik-Shemesh, 2011). Online bullying has become a topic of wide public discussion, especially after several cases in which victims took their own lives. These cases indicate that online bullying can have a mentally destructive effect on its victims (Goldschmidt, 2011). Clearly, online bullying is a phenomenon that must be addressed so as to reduce its occurrence, in light of its devastating effects on adolescents’ academic achievements, quality-of-life, and overall health and well-being. However, to properly address the issue, it is important to understand intercultural differences in terms of the rate and severity of online bullying practices, especially in a society as ethnically varied as that in the State of Israel. The goal of the current study was to identify such differences. The phenomenon of online bullying does not take place in a void; rather, it is related to the culture in which the bully and the victim were educated and to the context that gave rise to the bullying event (Hymel & Swearer, 2015). It appears that in some societies the cultural code and rules of behavior are tolerant of aggression and violence towards others, as a legitimate means for achieving one’s goals, whereas in other societies, the cultural code and normative behaviors oppose and rebuke such acts of violence (Barlett et al., 2014). Researchers who investigated the issue of culture have claimed that communities develop under various physical, social, and economic conditions and, therefore, they necessarily formulate a unique identity that distinguishes them from other communities and peoples. This unique identity includes a cultural ethos and basic beliefs, as well as language and religion; this conglomeration of factors constitutes the foundation of identity, which in turn informs the cultural beliefs and the worldview of a given people, its members’ understanding of the world and how to operate in it. Moreover, cultural identity informs the behaviors of the members of the cultural group also as they react to the stimuli in their surroundings. As a result, it may be assumed that also being affiliated with certain religious, ethnic or national cultures would lead to differences in behaviors related to online bullying (Hofstede, Hofstede & Minkov, 2010). The few studies that have attempted to examine the relationship between the phenomenon of online bullying and sociocultural characteristics found, for the most part, that such a relationship does in fact exist. A study that compared the frequency of online bullying in a sample of middle-school students of Canadian versus Chinese descent found that students of Chinese descent tended to be the victims of online bullying, whereas Canadian students were four times more likely to be the aggressors in online bullying events (Li, 2007). Additional studies have indicated intercultural differences in terms of online bullying: the study conducted in the US by Bartlett et al. indicated that Japanese students were less likely than their American counterparts to express positive attitudes regarding online bullying or to encourage such violent behavior. The American students constituted the group with greatest tolerance for online bullying, when comparing the attitudes of students in the US and in Japan (Barlett et al., 2014). The notion of intercultural differences regarding attitudes towards online bullying was confirmed in a study conducted in Thailand, which demonstrated differences between the percent of online bullying victims in different ethnic groups: non-Muslim students were more involved in online bullying than were Muslim students (Sittichai & Smith, 2013). In Israel, Bouhnik and Deshen (2012) found a significant correlation between the degree of religiosity among Jewish students and the tendency to bully others, such that secular students were most frequently involved in online bullying, followed by students who adhere to religious traditions, whereas members of the strictly religious group were least involved in online bullying. Given that in Israel the degree of religiosity is characterized by cultural differences, this study too can be viewed as confirming the claim that the phenomenon of online bullying is characterized by intercultural differences. An interesting finding that suggests that intercultural differences affect online bullying demonstrated that the phenomenon was more common in communities characterized as highly individualistic: in such communities, the emphasis is on values pertaining to the right of individuals to behave in ways that express their personal desires, whereas commitment to the community is de-emphasized. This, in contrast to the rate of online bullying found in communities characterized by a collectivist ethos, wherein the emphasis is on communal values and group affiliation (Barlett et al., 2014). Hofstede, Hofstede and Minkov (2010) found Western cultures to be more individualistic than cultures rooted in the Middle East and in Asia (Hofstede, Hofstede & Minkov, 2010). Thus, in the context of the varied ethnic components found in Israeli society, it may be assumed that secular Jewish communities whose members are most typically of European descent would demonstrate characteristics of an individualistic culture, compared to the community-centered ethos that is characteristic of the Christian and Muslim Arab communities in Israel, whose members are of Middle-Eastern or Near-Asian descent. A recent study conducted examined differences in online bullying between Jewish and Arab youth in Israel (Lapidot-Lefler & Hosri, 2016). Findings indicated that girls in the Arab sector tended to engage in online bullying more so than did boys in their sector and more than either girls or boys in the Jewish sector. However, the factor of cultural individualism vs. cultural collectivism and its relation to the phenomenon of online bullying was not examined in that study. Hence, the aim of the current study was to examine whether Israeli youths’ involvement in online bullying, specifically as victims and witnesses of online bullying, would be related to ethnocultural-religious differences. The main variables, i.e., ethnocultural-religious background and the tendency to uphold collectivist vs. individualistic values, were studied in the context of ethnocultural-religious sectors, i.e., among youths from the secular Jewish sector, the Muslim sector, and the Christian sector. The goal was to determine whether a relationship would be found between the aforementioned variables and the frequency of participants’ involvement in online bullying. The information and insights gleaned from the current study will contribute to a constantly-expanding pool of knowledge, intended to assist policy and decision makers, as well as educators, in formulating an effective set of tools for coping with the online bullying phenomenon in a society with multiple cultures. In Israeli society, the secular Jewish sector is more individualistic than either the Arab Muslim or the Arab Christian sectors. Consequently, in accordance with the findings of Bartlett et al. (2014) and the findings of the study by Bouhnik and Deshen (2012), it was hypothesized (H1) that the cybervictim and cyberbystander rates in the three sectors would differ. A second hypothesis (H2) was that the more an individual adheres to culturally individualistic attitudes, the more likely he or she is to be a victim of online bullying. Finally, the third hypothesis (H3) was that the correlation between individualism and being the victim of cyberbullying would differ according the participants’ ethnocultural-religious background (Israeli secular Jews, Muslims, and Christians). The total number of participants came to 301 students, of these, 122 were Jewish, 117 were Arab Muslims, and 62 were Arab Christians. Participants’ ages ranged from 12 to 18, with a mean age of 15.81 (SD = 1.87). Jewish respondents were significantly younger (M = 14.66, SD = 1.69) than their Muslim (M = 16.69, SD = 1.55) and their Christian (M = 16.40, SD = 1.55) counterparts (F (2, 298) = 52.78, p < .001, η2 = .262). The majority of participants from the Arab sector were girls (148, 83%), whereas in the Jewish sector, the number of girls was 44 (36%; χ2(2) = 68.26, p < .001). Demographic Questionnaire. This questionnaire, which was designed for research purposes, served to collect data regarding the following factors: age, gender, nationality, place of residence, family status, and computer usage. Online Bullying Questionnaire. This questionnaire is based on the bullying questionnaire designed by Olweus (1991), which was used in a Chinese version in the study by Huang and Chou (2010). Using the back translation method, the questionnaire was translated into Hebrew by the first author and has been used in a previous study (Lapidot-Lefler & Hosri, 2016). The same method was used to translate the questionnaire from English into Arabic, which was done by the second author of the current study, who is a native speaker of Arabic and who was assisted by an Arabic language expert. This questionnaire includes 16 items, which examine the frequency of the participant’s involvement in online bullying, using three measures: (A) As cyberbystanders who have witnessed the online bullying of others (for example, “Have you ever witnessed classmates being ridiculed, humiliated or disparaged via electronic media, for example on social platforms (Facebook, WhatsApp groups or Instagram) or text messages?”); (B) As cybervictims (for example, “were you ever maligned, criticized, or defamed online via any of the various media channels?”); (C) As cyberbullies, that is, actively involved in online bullying others (for example, “have you ever insulted, threatened, or harassed someone using an online medium?”). Participants indicated their responses on a scale ranging from 1 (= Never) to 5 (= Almost Daily). In the current study, Cronbach’s alpha was .85 on the section regarding cyberbystanders, .93 on the section regarding cybervictims, and .88 on the section regarding online bullying. Given that the current study’s main focus is on involvement in online bullying and on the experience of cybervictims, compounded with the fact that no differences were found between the religious-cultural groups in terms of online bullying rates (85% of the participants gave a negative response on the various items), findings regarding the scale of active bullying were omitted. Hence, findings are reported only in regard to the scales of cyberbystanders (exposure to the online bullying of others) and cybervictims (being the direct target of online bullying). A total score was calculated for cyberbystander rates and for cybervictim rates. Individualism and Collectivism Questionnaire. Designed by Hui and Villareal (1989), this questionnaire examines the participant’s degree of belief in individualism–collectivism, based on the responses to 20 items. Participants indicated their degree of agreement with statements that represent individualistic or collectivist values, concepts, and norms (for example, “if you want things done properly, you’d better do them yourself”; “every family faces its own unique problems and there’s no point in telling your relatives about your own”; “if a relative tells me about a particular difficulty, I will do what I can to help”). To this end, participants made use of a Likert-like scale, ranging from 1 (= Completely Disagree, representing a strong collectivist approach) to 6 (= Completely Agree, representing a strong individualistic approach). A total possible score for individualism was calculated, based on the number of items. The questionnaire was translated into Hebrew by the first author, using the back translation method, and translated from English into Arabic by the second author assisted by a language expert, using the same method. Cronbach’s alpha for this questionnaire was .88. Participants were recruited for the study using Facebook’s social network as well as e-mails, after advertising the study in several Jewish, Muslims and Christians middele scools and high schools in Israel. Volunteer participants downloaded the questionnaire through an online link. The questionnaires were available both in Hebrew and Arabic. Given that the focus of the study is on bullying in and online environment, we decided to have the questionnaires distributed and completed online as well. The time allotted for completing the questionnaires was between 15 and 20 minutes. Participation was on a voluntary basis, and the participants were informed that all information would remain anonymous, that the data analysis would be on a group level, and that the findings would be used solely for research purposes. Furthermore, they were informed that if they felt uncomfortable at any time, they were free to stop completing the questionnaire. Data were analyzed to present the descriptive statistics of the study measures. Chi Square test was used with the distribution of online victimization by sectors. ANOVA was used for the degree of individualism by sector, and correlations were examined with the participants’ age. Partial correlations were calculated between the degree of individualism and the cyberbystander rates, adjusting for age. ANOVAs were conducted to determine whether the cyberbystander rate was a function of the interaction between sector affiliation and individualist – collectivist beliefs. Significant interactions were interpreted using simple slopes analysis (Aiken & West, 1991; Dawson, 2014). The current study examined aggressive aspects of human behavior in different online environments. Therefore, it required a high degree of self-disclosure from the participants. This in turn demanded that the study be conducted with complete anonymity and confidentiality regarding all of the data collected. Hence, findings are presented in relation to subgroups within the population, rather than in relation to individual participants. All participants freely volunteered to participate in the study. Furthermore, the participants received the researcher’s contact details, in order to obtain additional information, a copy of the results, or additional details, within the accepted standards. Examining participants’ rate of involvement in online bullying as cyberbystanders reveals that about two thirds of the participants reported witnessing various types of violence on the Internet (types included were harassment or threat, ridicule, defamation, and identity theft; see Table 1). Approximately one third of the participants had witnessed ridicule, defamation, and identity theft at least once a month, and approximately one fifth of the participants witnessed harassment or threat at least once a month. Approximately one half of the participants reported that they did not suffer emotional harm due to online bullying, whereas 14% reported that they suffered emotional harm at least once a month. All in all, 244 participants (81 %) reported being witnessing to at least one type of online bullying and 109 participants (36 %) reported being cyberbystanders to witnessing all types of online bullying. As regards directly experiencing various types of online bullying (as victims), all in all, 168 participants (56 %) reported being cybervictims of at least one type of online bullying, and 32 participants (11 %) reported being cybervictims of many types of online bullying. It should be noted that participants’ age was unrelated to the degree of participants’ involvement in online bullying, whether as cyberbystanders (r = -.04, p = .465 to r = .16, p = .006; one significant correlation of 5), or as cybervictims (r = -.24, p < .001 to r = .06, p = .301; one significant correlation of 5). The small number of male participants from the Arab sector precluded any analysis by gender and sector. An examination of the percentage of cybervictims online bullying (Table 2) reveals significant differences by religious groups. Reports of being cyberbystanders, to incidents of harassment or threat, ridicule, defamation, and identity theft were higher among youths from the Arab sector than among youths from the Jewish sector. No significant sectoral difference was found in terms of emotional damage among cyberbystanders. The percentage of cybervictims of harassment or threat was similar by sector. However, the rate of cybervictims of ridicule was higher among youths from the Jewish sector than among youths from the Arab sector. In terms of identity theft, a larger percentage of reports came from the Arab Christian sector than from the Jewish sector. Similarly, a higher percentage of Arab Christian youths reported emotional harm following involvement in online harassment as bystanders than did Jewish youths. The measure of individualism–collectivism was significantly correlated with the age of participants (r = -.31, p < .001), such that the younger the participants were, the higher their level of individualism. The variable of individualism differed significantly by sector, beyond the significance of the age variable (F(2, 297) = 36.24, p < .001, η2 = .196). The highest rate of individualism was found in the secular Jewish sector (M = 3.77, SD = 0.64), followed by the rate in the Arab Christian sector (M = 3.25, SD = 0.59; p < .001), and was lowest in the Arab Muslim sector (M = 3.01, SD = 0.46; p = .026). As previously noted, gender differences between the sectors could not be tested. To test the hypothesis regarding the relationship between the measure of individualism–collectivism and cyberbystander rates, two partial correlations were calculated: between individualism–collectivism and both cybervictim and cyberbystander rates, while controlling for age. In both cases, correlations were significant and negative (r = -.34, p < .001 – as cybervictims; r = -.36, p < .001 —as cyberbystanders). In other words, in contrast to our hypothesis (H2), the higher the level of individualism among youths, the less likely they were to be involved in online harassment. The hypothesis (H3) regarding an interaction between sector and the degree of individualism was examined using two ANOVAs. The effect of sector on the relationship between the degree of individualism and cyberbystander rates was not significant (F(2, 294) = 1.66, p = .192, η2 = .011); however, sector did have a significant effect on the relationship between the degree of individualism and cybervictim rates (F(2, 294) = 14.96, p < .001, η2 = .092). The interaction was interpreted using simple slopes analysis (Aiken & West, 1991; Dawson, 2014). In the secular Jewish sector, a significant negative relationship was found between degree of individualism and cyberbystander rates (B = -2.50, t = -9.02, p < .001), whereas no significant relationship was found in either the Arab Muslim (B = -0.51, t = -1.25, p = .213), or the Arab Christian sector (B = -0.24, t = -0.53, p = .599). The aim of the current study was to examine an aspect of online harassment that has yet to be considered in Israeli society, namely, the ethnocultural-religious context. To this end, the study examined the relationship between ethnocultural-religious affiliations (differences between the secular Jewish, the Arab Muslim, and the Arab Christian sectors), individualist versus collectivist values, and involvement in online bullying incidents. The findings of this study indicate that online bullying is a common phenomenon that affects almost all youths: 82% of the study participants had encountered at least one type of online bullying (harassment or threat, ridicule, defamation, or identity theft), and of these, 39% had encountered every single one of these types of bullying. Furthermore, 55% of the participants had been victims of at least one type of online bullying. It seems that only a small percentage of youths are actively involved in bullying and most of them are bystanders (Amichai-Hamburger, 2013). Another possible explanation for the high percent of bystanders is the fact that about 80% of online bullying events are carried out in the presence of witnesses (O’Connell, Pepler, & Craig, 1999). The current finding of a high percentage of witnesses of online violence is in line with those of previous studies conducted in Israel, (e.g., Bouhnik & Deshen, 2012; Goldschmidt, 2011; and Olenik-Shemesh, Heiman, & Eden, 2012), which also found online bullying to be a common phenomenon. As noted, one of the main goals of this research (H1) was to assess whether there were differences between ethnocultural-religious sectors in Israel in terms of cybervictim and cyberbystander rates. According to the study’s findings, Hypothesis 1 was supported: the sectors did differ in terms of the cybervictim and cyberbystander rates. A higher cyberbystander rate, witnessing either harassment or threat, ridicule, defamation, or identity theft, was reported by youths in each of the two ethnocultural-religious Arab sectors than by youths in the secular Jewish sector. Ridicule alone was reported by a higher percentage of youths from the secular Jewish sector than by youths from either of the Arab sectors. Victims of identity theft were more common among Arab-Christian-sector youths than among secular-Jewish-sector youths. The percentage of youths from the Arab Christian sector that reported emotional damage resulting from online bullying was higher than among youths from the secular Jewish sector. Similar findings were described in previous studies, which indicates that differences in the percentage of bullying incidents could be related to participants’ religious or ethnocultural-religious background (Barlett et al., 2014; Sittichai, & Smith, 2013). In addition, a previous study conducted on this topic in Israel reported mixed findings. On the one hand, as in the current study, no differences were found between ethnic groups (the previous study compared groups of Jewish and Arab youths) in terms of either cybervictim or cyberbystander rates. On the other hand, in contrast to the current study, the previous study did find differences between the groups in terms of online bullying rates: specifically, Arab female were more likely to act as cyberbullies than were Jewish female youths, Jewish male youths, or Arab male youths (Lapidot-Lefler & Hosri, 2016). The finding of mixed results indicates the complexity of the issue and the need to continue to examine this issue in depth. An additional aim of the current study was to determine whether there was a relationship between groups’ attitudes towards individualism, which would indicate different cultural perceptions, and if so, whether this difference would correlate with the likelihood of being a cybervictim. Findings related to this question were consistent; however, their direction was contrary to our hypothesis (H2): a stronger cultural perception of individualism (i.e., less of a tendency towards collectivism) correlated with a lesser likelihood of being either a cyberbystander or a cybervictim. This finding is contradictory to the findings of a different –albeit recent– study, which indicated that cyberbullying is more common among communities that tend towards individualism (Barlett et al., 2014). This contradiction may suggest that the variable of moral culture (individualism versus collectivism) plays a more dominant role in the likelihood of becoming a victim of cyberbullying than does the variable of ethnocultural-religious background. The tendency towards individualism is stronger among youths of the secular Jewish sector, who also reported lower cyberbystander rates than did members of the other groups, although a similar but less strong tendency towards individualism was found also among youths of the Arab Christian sector. As previously noted, this is an initial exploratory study; hence, the issue requires further in-depth research. An additional possible explanation for the finding of the correlation between a tendency towards collectivist values and higher cyberbystander rates could be related to the need to demonstrate one’s affiliation with the group. This need is characteristic of a society with a collectivist social approach, wherein group values and the individual’s affiliation with the group are emphasized. Previous studies have shown that bullying can be part of a strategy to improve one’s social standing and to acquire power within the peer group. Most often, this is a strategy that pays off, as the bullies are perceived to have gained popularity (Caravita, Di Blasio, & Salmivalli, 2009), although they might not be the most liked (Cillessen, & Rose, 2005). In this sense, cyberbullying can be viewed as a strategy for increasing one’s sense of belonging to the group. In the case of Israel it is very difficult to separate the collective variable from the religious-ethnic variable. It is possible that the collectivist variable may be more important than the religious-ethnic variable. In summary, it is apparent that differences were found between ethnocultural-religious groups and between moral-cultural values (individualism versus collectivism) in terms of the percentage of involvement of youths in online bullying. Findings suggest that a cultural tendency towards individualist values is related to a lesser likelihood of involvement in online bullying as either cybervictims or cyberbystanders. In other words, the greater a society’s tendency towards individualism, whereby one is not dependent on the other or on the society and there is no obligation to adhere to strict social mores in order to uphold the society’s existence (in contrast to culturally collectivist societies), the less likely are the youths of such a society to be involved in online bullying. Hence, it should be noted that despite the complex relationship between religious affiliation and online bullying, the factor of individualism–collectivism (which may be associated with social conservativism versus openness) also plays an important role in affecting youths’ involvement in online bullying. As mentioned above, the current study explored the ethnocultural-religious context of online bullying in Israel. No attempt was made to isolate the religious variable or the level of religiosity of the participants. Follow-up studies should examine the religious variable in greater depth. One of the limitations of the study is related to the choice of population groups surveyed, which do not represent all of the ethnocultural-religious groups in Israel. Thus, for example, Druze students were not part of the sample. Further studies should consider using a more comprehensive and representative population sample, so as to enhance our understanding of effects of ethnocultural-religious backgrounds on involvement in online bullying incidents. Examination of the minority variable and the comparison of different types of minorities (religious, national, ethnic) in different countries around the world will also contribute to the development of the knowledge in the field. Furthermore, it is possible that expanding the methodology to include also qualitative methods, such as semistructured interviews, could render a broader pool of knowledge and provide an additional dimension to our understanding. Given the small number of male students from the Arab sector, it was impossible to examine the gender factor in relation to the topic of study, which was another limitation of the current study. Hence, follow-up studies should seek to restore the gender balance in the study groups and examine additional factors, such as socioeconomic background, parents’ level of education, and time spent in an online environment, to mention but a few. In addition to expanding our knowledge on the issue of online bullying, the current study also has other practical implications. The issue examined in this study is a cause for sincere alarm, as current events demonstrate that without proper intervention, this phenomenon can have severely destructive results, such as cases in which the victim of the online bullying commits suicide (Smokowski & Kopasz, 2005). The popularity of the phenomenon and its severe impact underscore the need to address the issue, through prevention, by creating a sense of personal responsibility among children and youths. At the school level, it is important to openly state the school’s policy. In other words, schools should define their goals, objectives, guidelines, as well as their methods for implementing and evaluating progress. Policies should include a means for students to anonymously report cases of online bullying (Willard, 2006). The infrastructure for such a policy can be established by working with the parents, teachers, and students and increasing the presence of adults in the virtual realm, heightening awareness, and taking responsibility for the online activities of one’s peer group. Further resources, such as programs addressing life skills and involving open discussions with students, and help students acquire tools and skills for adopting optimal online behavior at coping with emotional damage. This study’s findings, along with the findings of other studies in the field, indicate that in most cases of on line bullying, there are other children and youths who assume the role of cyberbystanders. The behavior of the cyberbystanders has a significant effect on the outcome of the bullying: often cyberbystanders join in active bullying that was initiated by someone else and thus aid and abet the bully. Other cyberbystanders refrain from actively attacking the victim, but still provide the bully with positive feedback. Finally, some of the cyberbystanders object to the bullying and attempt to comfort and support the cybervictim, while trying to put an end to the bullying (Sutton & Smith, 1999). These observations indicate that schools should invest significant efforts in working with the cyberbystanders, because they constitute a significant group and their influence is substantial. The school has an important role in fortifying those cyberbystanders who object to and resist the bullying. In light of the current study’s finding that online bullying is related to collectivist attitudes, schools should plan lectures and conferences with parents, to heighten their awareness of the phenomenon of bullying in societies that emphasize collectivism and to increase their involvement in their children’s world, so as to support the efforts to eradicate the phenomenon. Efforts to involve the parents should also include the acquisition of tools and means for constructing open, positive and mutual communication with their teenage children. These recommendations are especially pertinent in regards to the Arab society in Israel, which is known to be collectivist in nature (Abu-Baker, 2003; Ben-Arieh, Khooury-Kassabri & Haj-Yahia, 2006). There is no doubt that parents play a significant role in and have a strong impact on the lives of their children. Finally, we may conclude that the phenomenon of online bullying is common among youths in Israeli society. Coping with this phenomenon requires educational staff, in general, and educational counselors, in particular, to develop prevention and treatment programs, in an attempt to eradicate the phenomenon and limit its detrimental effects. The intent of the current study was to shed light on the relationship between online bullying and cultures in Israeli society, with a dual goal. On the theoretical level, we sought to increase the pool of knowledge regarding the relationship between cultural differences and the phenomenon of online bullying; on the practical level, we sought to gain insights about how cultural factors influence online bullying, in order to help cope with the phenomenon. Understanding the effect of cultural aspects on online bullying as manifested in various cultural groups could help professionals cope with the problem more effectively, by designing intervention programs that utilize this information and target the different cultural groups in a multicultural society, as part of the effort to eradicate the phenomenon of online bullying. Abu-Baker, Khawla (2003): Marital problems among Arab families: Between cultural and family therapy interventions. In: Arab Studies Quarterly, Vol. 25, Nr. 4, pp. 53-74. Aiken, Leona S.; West, Stephen G. & Reno, Raymond R. (1991): Multiple regression: Testing and interpreting interactions. Newbury Park, London: Sage. Amichai-Hamburger, Yair (2013): The good the bad and the ugly on the Internet – The psychology of life online. Tel Aviv: Matar (in Hebrew). Barlett, Christopher P., et al. (2014): Cross-cultural differences in cyberbullying behavior: a short time longitudinal study. In: Journal of Cross Cultural Psychology, Vol 45, Nr. 2, pp. 300-313. Ben-Arieh, Asher; Khoury-Kassabri, Mona & Haj-Yahia,. Muhammad M. (2006): Generational, and national differences in attitudes toward the rights of children in Israel and Palestine. In: American Journal of Orthopsychiatry, Vol. 76, Nr. 3, pp. 381-388. Bouhnik, Dan & Deshen, Mor (2012): Youths’ immoral behavior in the Internet environment. In: Eshet-Alkalai, Y. et al. (Eds. ): Proceedings from the Chase Conference on ICT Research: The Learner in the Technological Era, pp. 8-16. Raanana: The Open University (in Hebrew). Caravita, Simona; Di Blasio, Paola & Salmivalli. Christina (2009): Unique and interactive effects of empathy and social status on involvement in bullying. In: Social development, Vol. 18, Nr. 1, pp. 140-163. Cillessen, Antonius HN & Rose, Amanda J. (2005): Understanding popularity in the peer system. In: Current Directions in Psychological Science, Vol. 14, Nr. 2, pp. 102- 105. Dawson, Jeremy F. (2014): Moderation in management research: What, why, when and how. In: Journal of Business and Psychology, 29, Nr. 1, pp.1-19. Goldschmidt, Roiy. (2011): Virtual violence among youths. In: Jerusalem,The Knesset Center for Research and Information. (in Hebrew). Hofstede, Geert; Hofstede, Gert Jan & Minkov, Michael (2010): Cultures and organizations: Software of the mind. Revised and expanded. New York: McGraw-Hill. Huang, Yun-yin & Chou, Chien (2010): An analysis of multiple factors of cyberbullying among junior high school students in Taiwan. In: Computers in Human Behaviour. Vol. 26, Nr. 6, pp. 1581-1590. Hui, Harry, C. & Villareal, Marcelo, J. (1989): Individualism-collectivism and psychological needs: Their relationship in two cultures. In: Journal of Cross Cultural Psychology, Vol. 20, Nr. 3, pp. 310-323. Hymel, Shelley & Swearer, Susan M. (2015): Four decades of research on school bullying. In: The American Psychologist, Vol. 70, Nr. 4, pp. 293-299. Lapidot-Lefler, Noam & Barak, Azy (2012): Effects of anonymity, invisibility, and lack of eye contact on toxic online disinhibition. In: Computers in Human Behavior, Vol. 28, Nr. 2, pp. 434-443. Lapidot-Lefler, Noam & Dolev-Cohen, Michal. (2015): Comparing cyberbullying and school bullying among school students: Prevalence, gender, and grade level differences. In: Social Psychology of Education, Vol. 18, Nr. 1, pp. 1-16. Lapidot-Lefler, Noam & Hosri, Hanan (2016): Cyberbullying in a diverse society: Comparing Jewish and Arab adolescents in Israel through the lenses of individualistic versus collectivist cultures. In: Social Psychology of Education, Vol. 19, Nr. 3, pp. 569-585. Li, Qing (2007): Bullying in the new playground: Research into cyberbullying and cyber victimization. 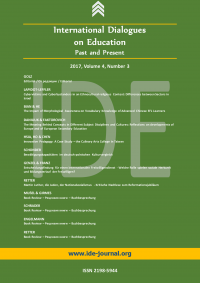 In: Australasian Journal of Educational Technology, Vol. 23, Nr. 4, pp. 435-454. Mason, Kimberly L. (2008): Cyber bullying: A preliminary assessment for school personnel. In: Psychology in the Schools, Vol. 45, Nr. 4, pp. 323-348. Mesch, Gustavo S. (2003): The family and the Internet: The Israeli case. In: Social Science Quarterly, Vol: 84, Nr. 4, pp. 1038-1050. O’Connell, Paol; Pepler, Debra & Craig, Wendy (1999): Peer involvement in bullying: Insights and challenges for intervention. In: Journal of Adolescence, Vol. 22, Nr. 4, pp. 437–452. Olenik-Shemesh, Dorit; Heiman, Tali & Eden, Sigal (2012): Cyberbullying victimization in adolescence: Relationship with loneliness and depressive mood. In: Emotional and Behavioral Difficulties, Vol. 17, Nr. 3-4, pp. 361-374. Olweus, Dan (1991): Bully/victim problems among schoolchildren: Basic facts and effects of a school based intervention program. In: The development and treatment of childhood aggression, Vol. 17, pp. 411-48. Riebel, Julia; Jäger, Reinhold S. & Fischer, Uwe C. (2009): Cyberbullying in Germany – An exploration of prevalence, overlapping with real life bullying and coping strategies. In: Psychology Science Quarterly, Vol. 51, Nr. 3, pp. 298-314. Shariff, Shaheen & Hoff, Dianne L. (2007): Cyber bullying: Clarifying legal boundaries for school supervision in cyberspace. In: International Journal of Cyber Criminology, Vol. 1, Nr. 1, pp. 76-118. Sittichai, Ruthaychonnee & Smith, Peter K. (2013): Bullying and cyberbullying in Thailand: A review. In: International Journal of Cyber Society and Education, Vol. 6, Nr. 1, pp. 31-44. Slonje, Robert; Smith, Peter K. & Frisén, Ann (2013): The nature of cyberbullying, and strategies for prevention. In: Computers in Human Behavior, Vol. 29, Nr. 1, pp. 26-32. Smith, Marshall (2015): Children in the Online World: Risk, Regulation, Rights. In: Contemporary Sociology: A Journal of Reviews, Vol. 44, Nr. 2, pp. 254-256. Smokowski, Paul R. & Kopasz, Kelly Holland (2005): Bullying in school: An overview of types, effects, family characteristics, and intervention strategies. In: Children & Schools, Vol. 27, Nr. 2, pp. 101-110. Strohmeier, Dagmar; Aoyama, Ikuko; Gradinger, Petra & Toda, Yuichi (2013): Cybervictimization and cyberaggression in eastern and western countries: Challenges of constructing a cross-culturally appropriate scale. In: S. Bauman, D. Cross & J. Walker, (Eds. ):, Principles of cyberbullying research: Definitions, measures, and methodology (pp. 166- 180). New-York: Routledge. Suler, John (2004): The online disinhibition effect. In: Cyberpsychology & Behavior, Vol. 7, Nr. 3, pp. 321-326. Sutton, Jon & Smith, Peter K. (1999): Bullying as a group process: An adaptation of the participant role approach. In: Aggressive Behavior, Vol. 25, Nr. 2, pp. 97-111. Tarablus, Tamar; Heiman, Tali & Olenik-Shemesh, Dorit. (2011): Online violence versus face-to-face violence among youths. In: Eshet-Alkalai, Y.; Caspi, A.; Gary, N. & Yair, Y. (Eds. ): Proceedings from the Chase Conference on ICT Research: The Learner in the Technological Era, pp. 174 – 180. Raanana: The Open University (in Hebrew). Vandebosch, Heidi & Van Cleemput, Katrien (2009): Cyberbullying among youngsters: Profiles of bullies and victims. In: New Media & Society, Vol. 11, Nr. 8, pp. 1349-1371. Von Marées, Nandoli & Petermann, Franz (2012): Cyberbullying: An increasing challenge for schools. In: School Psychology International, Vol. 33, Nr. 5, pp. 467-476. Wang, Jing; Iannotti, Ronald J. & Luk, Jeremy W. (2012): Patterns of adolescent bullying behaviors: Physical, verbal, exclusion, rumor, and cyber. In: Journal of School Psychology, Vol. 50, Nr. 4, pp. 521-534. Willard, Nancy E. (2006): Cyberbullying and cyberthreats: Responding to the challenge of online social cruelty, threats, and distress. Center for Safe and Responsible Internet Use. Research Press. Ybarra, Michele L. & Mitchell, Kimberly J. (2004): Online aggressor/targets, aggressors, and targets: A comparison of associated youth characteristics. In: Journal of Child Psychology and Psychiatry, Vol. 45, Nr. 7, pp. 1308-1316.